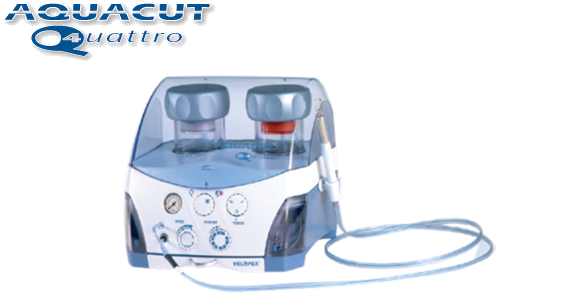 The Velopex Aquacut Quattro is our Air abrasion unit used for Pain Free and Minimally Invasive Dentistry. Drill without the Drill! Through the use of Aluminium Oxide, Sodium Bicarbonate and ‘Sylc For Aquacut’, a desensitising, bio-active powder for cleaning and stain removal, the Aquacut Quattro can be used for a host of everyday procedures with a dramatically reduced need for the use of anaesthesia. Its gentle and highly effective cleaning, stain removal and cavity preparation make it a favourite with your patients. What is an Aquacut Quattro? It is the most versatile piece of equipment in you operatory. What can this machine do for you? Velopex International’s Aquacut Quattro is an ideal tool for minimally invasive and cosmetic dentistry. With no direct contact with the tooth structure, Aquacut Quattro produces no vibration, turbine noise, heat generation or smell, and it greatly reduces the need for local anesthesia. In cleaning mode, the Aquacut Quattro is a valuable tool for the hygienist, delivering highly efficient stain removal and cleaning. It also increases the effectiveness of tooth whitening procedures. The Aquacut Quattro’s patented handpiece delivers a high-speed fluid stream, fed from a self-contained reservoir, to create a liquid cutain around the abrasive medium. This provides comfortable and efficient cavity preparation. The triple-action foot control enables cut, clean, wash and dry operations to be carried out through the same handpiece, allowing continuous opertation without interruption. The twin powder chambers permit cutting and prophy or stain removal at the twist of a switch. For example, suspicions concerning an area of possible decay and can be confirmed with the Aquacut Quattro in cleaning mode, and then treated by switching back to cutting mode. Aquacut Quattro is a fraction of the cost of a hard-tissue laser, while providing fast, efficient cutting and cleaning with very high levels of patient acceptability. The Aquacut Quattro cuts quickly but very conservatively, minimizing the removal of sound tooth material and eliminating the risk of chipping or stress fracturing.